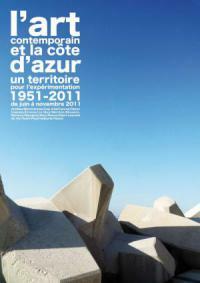 Devoted to 60 years of contemporary art, from 1951 to the present day Contemporary Art and the Côte d’Azur - An Area for Experimentation, 1951 – 2011 is the arts event of summer 2011. An impressive itinerary covering fifty or so cultural centres (museums, art centres, art schools, foundations, galleries, cultural and arts associations) provides the public with works by over 300 artists, representative of a colourful history, punctuated with important trends, figures and events. Contemporary Art and the Côte d’Azur aims to go beyond traditional clichés and to highlight the region’s importance as a veritable testing ground for the arts, producing and welcoming artists in an atmosphere of exceptional creative energy. This energy has reinvented itself down through the years as art has evolved, taking into account the social and political parameters that exceed the domain of creation. La Côte d’Azur is still “the great art workshop” that art historian André Chastel spoke of. But it is also a testing ground for the arts; an “area for experimentation”, a feature highlighted in this exhibition. The institutions spearheading this project decided to organize an exhibition of a historical and scientific dimension in order to highlight the subject matter and the media used by artists since 1951 (painting, video, the object, performance, sound, architecture, colour, the figure and self-representation). This exhibition represents the first phase of the project and includes the 20th century national museums of the Alpes-Maritimes region (the Marc Chagall museum in Nice, the Fernand Léger museum in Biot, the Pablo Picasso museum, War and Peace, in Vallauris, as well as the offsite projects at the Eco-Parc in Mougins and at the heart of Coaraze village), the MAMAC -Nice Museum of Modern and Contemporary Art-, the Jean Cocteau museum in Menton, the Château de Villeneuve/Emile Hugues Foundation in Vence and the Villa Arson Contemporary National Art Centre in Nice. By looking beyond the usual reference points of the different artistic movements, this exhibition is able to reveal certain similarities in terms of an artistic approach. The variety of artistic works on display allows the viewer to create connections and comparisons and to understand what links the works and what makes them different. The exhibition also highlights the intrinsic value of each artwork. This event is the sequel to The Côte d’Azur and Modernity Exhibition 1918 – 1958, organized in 1997 by thirty or so establishments in the Alpes-Maritimes region. The catalogue, Contemporary Art and the Côte d’Azur - An Area for Experimentation, 1951 – 2011 will be published by Presse du Réel Publishers / JRP Ringier and will be available in French and English. Expected release date: August 2011. The Contemporary Art and the Cote d’Azur Project is supported by the Minister for Culture and Communications, the Provence-Alpes-Côte d’Azur region and the Alpes- Maritimes County Council’s.